Hi everyone! Hope your day is going wonderfully so far!! It is a GORGEOUS day in Missoula! Sunny, mild...I would daresay almost warm....but I think the air is also full of allergens. Because I have been sneezing non-stop! Oh well...I will deal with that if it means nice weather. Josh and I planted two strawberry plants yesterday. They are sitting in the windowsill with the most sunshine in our house, and I can't wait to watch them grow and grow. We are thinking of planting a small garden this year with things we eat often...like sweet onions, strawberries, tomatoes, and maybe some grapes. I think it sounds like something fun we can do together, and we will get some rewards from it (if we do it right...tee hee!). What do you think...let me know if there are any other fruits or veggies that you think we just have to try and grow! I have a few cards to share with you today! I did all of them with the Olympics of Stamping at the Moxie Fab blog in my mind. First up is my card for Sketch 156 at CPS this week, and fits the "Hello/Thinking of You" theme for the OOS. Instructions: Fold white cardstock in half to make card base, and round the bottom corners. Emboss the front using a Cuttlebug and Argyle embossing folder. Tie pink ribbon around the bottom. Stamp the label, shoe and sentiment to white cardstock and cut out. Adhere over top of the ribbon using dimensional adhesive. Accent with colored pearls. For these next few cards, I played with the PTI spring color challenge that Nichole came up with. This first one uses Dawn's color combo of aqua mist, hibiscus burst, spring moss and fresh snow. It also fits the "Thank You" section of OOS. Instructions: Fold white cardstock in half to make card base, and round the bottom corners. 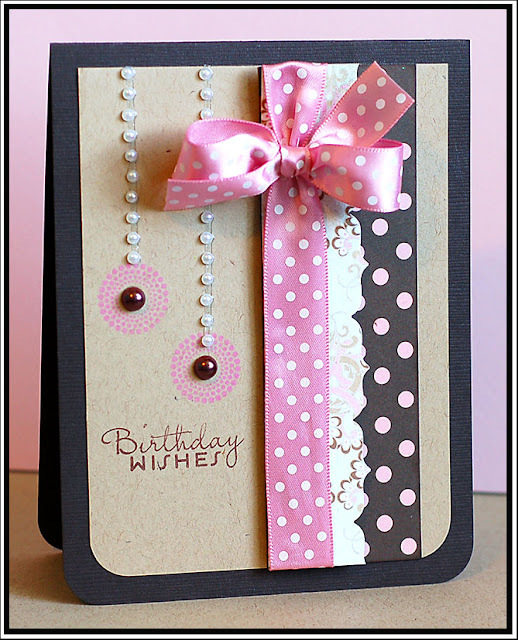 Stamp the three dots to the front of the card, and accent with matching colored jewels. Stamp the sentiment to the right of the dots. This next one uses Kelly Purkey's color picks of raspberry fizz, summer sunrise, melon berry, and sweet blush. It is goes with the "Hello/Thinking of You" section of OOC. Instructions: Fold orange cardstock in half to make card base, and round the bottom corners. Round the bottom corners of a block of white cardstock. 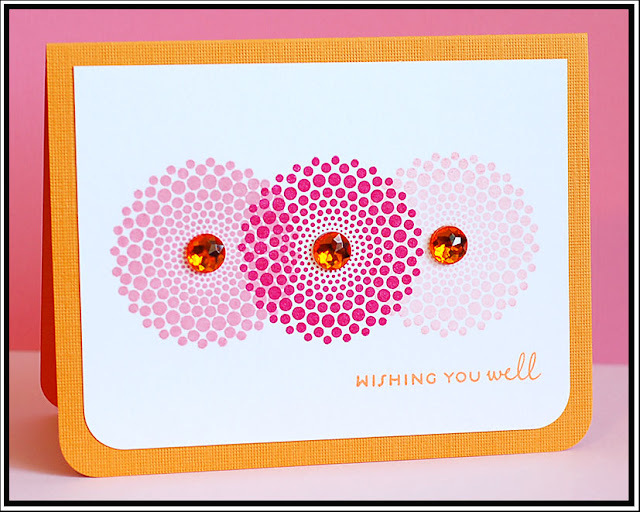 Stamp the three dots to the middle of the cardstock, and accent with orange jewels. Stamp the sentiment below them, and adhere the block to the front of the card. And last but not least, this one uses Lisa Johnson's color choice of sweet blush, vintage cream, kraft, and dark chocolate. And yes...I am a bit smitten with the Dot Spots set from PTI. I ♥♥♥ this set lots!! It fits the "Happy Birthday" section of OOC. Instructions: Fold chocolate brown cardstock in half to make card base, and round the bottom corners. Round the bottom corners of a block of kraft cardstock. Ink the edges of a strip of dotted paper and adhere to the right side of the kraft block. Stamp the dots and sentiment to to the left side, and adhere the entire block to the front. Punch a border to a strip of paper and tie ribbon around the left side. Adhere to the dotted strip using dimensional adhesive. Accent the stamped dots with pearls. Do you want to hear something crazy? I used to say I was just NOT a stamper. I struggled with stamping SO much. When we started getting sponsors at the CPS blog, and most of them were stamping companies...I didn't know if I was going to be able to do it. But, I have found the type of stamps, images, and ink that work best for me...and now I actually love it! There are so many more sentiment possibilities out there when you use stamps, and all the fabulous colors of ink. I just had to find my system, and now I consider myself a stamper. Craziness, I tell you. Wipe them down with a damp cloth or baby wipe, let it dry, and then put the plastic cover back on it. And then when you are stamping...use this to hold down the paper blocks you are stamping on. 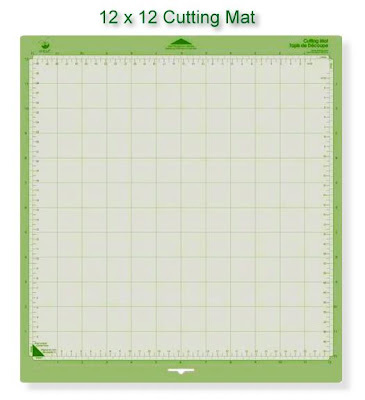 It has all the measurement grids you need for marking pencil lines where you want to stamp...and it makes a safe place for letting your stamped images dry. I use pigment ink A LOT, and we all know that it smears. I just put this whole piece to the side to let my inky images dry so they don't get ruined. This is my stamping secret that I am now sharing with all of you! It is how I get images/sentiments to stamp straight, and how I don't smear them all over. Oh my goodness...it is hilarious!! I love this show! 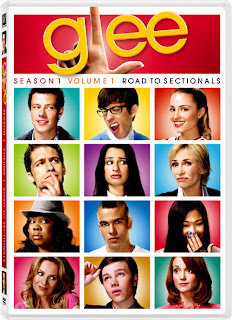 I very rarely watch many shows on television, and we don't have DVR or Tivo (I know...we are probably one of very few. It just $16 per month that doesn't seem necessary.) So, I just wait until they are available on Netflix...and this is at the top of my queue now. Disk 2 is coming tomorrow! I cringe during the scenes with his wife....she portrays the type of woman that I just don't care for in the least. But, I adore the rest of the show. I am excited to see what happens next! Any thoughts on American Idol this week? I think the right people went home...I totally agree with you America. Although the majority of them did SO much better this week...those 4 were still pretty bad. And I was SO excited to see Danny Gokey sing last night! That isn't my favorite song of his, but I do love the lyrics, and he seems so excited about it. I am happy that things are turning out for him...I adore him and his outlook on life! You have been busy :D Lovely set of cards. Love the CAS PTI ones. Each of these cards is so beautiful. Your cards are always eyecatching. Gorgeous cards Lea! It's gonna be fun playing along with you on Stacey's colour challenges - glad to see a fellow PTI fan! You never cease to amaze me with how you make such beautiful cards with different styles. Wow! Your cards are just fabulous!! Your stamping divine!! Thanks for the tip! All of your cards are stunning! My favorite is Wishing You Well-the way you used the colors is gorgeous. 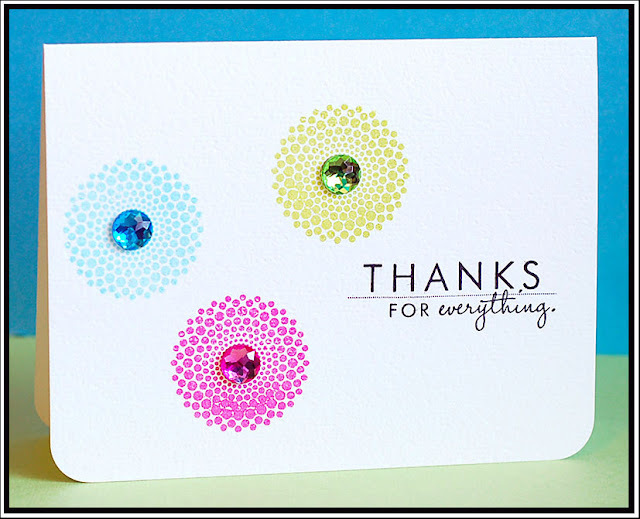 I love your use of Dot Spot in all of the cards but my favorite is Wishing You Well! The jewels really make it pop! Oh golly girlfriend, you are totally rockin' that Dot Spot set! When I first saw that set I didn't know how I would use it but now that i've seen your cards, I think I NEED it, a lot! LOL! hee hee!!! It's no secret that you inspire me so much! You were busy! 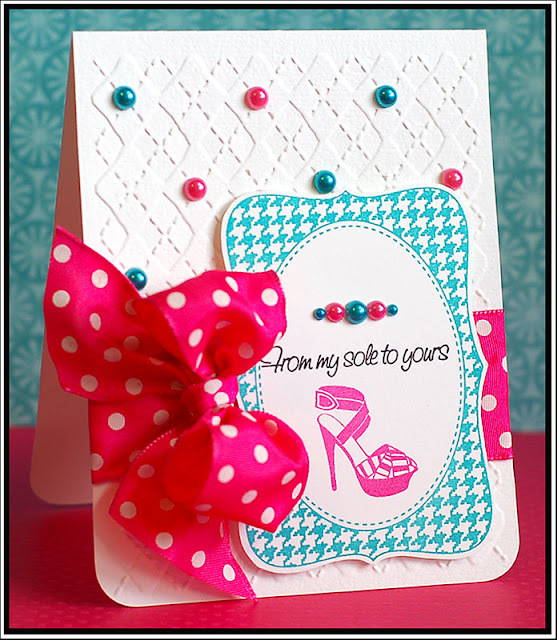 LOVE the double argyle card with the "sole!" The bow is FAB! This is beautiful. Love the colours and design. I was just stopping in to say thanks for the sweet comment you left on my blog, but I stayed awhile! There were so many beautiful creations to look at! Wow! Thanks so much for visiting! what great cards. thanks so much for popping by my blog. WOw. Those cards are STUNNING! Especially like the last two ones...they are sooo beautiful! your cards are just beautiful! that circle set is on my list to buy!